My heartfelt thanks to Gary Meyer for picking The Evening Class up as his website of the week on his ever-informative Balboa Theater email newsletter. For those of you who haven't already subscribed, you really should. Not only does the newsletter keep you apprised of the creative programming at the Balboa, but amplifies your viewing pleasure of any particular screening with ample links to online reviews and commentary. Rich and easy! 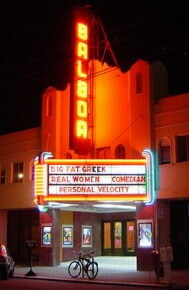 Gary writes: "The Bay Area must have more passionate film lovers than any other city. They see movies, talk about them and write about them in impressive numbers. Many movie websites are created here. One of my favorites is Michael Guillén's The Evening Class. He reviews films and offers new items. But the core of the site are his in-depth interviews with the people who make movies. He usually gets a good chuck of time to record an interview and transcribe it for our reading pleasure. It is the closest thing to being there when we obviously weren't. Recently the directors of Little Miss Sunshine, Valerie Faris and Jonathan Dayton were in town and Michael got to spend quality time with them. Enjoy." 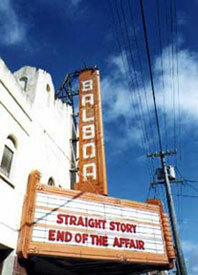 The Balboa is currently showing Little Miss Sunshine in Theater 1 at (12:00), 2:20, 4:40, 7:00, and 9:20. Not only is this great because the film is so enjoyable in and of itself but because it heralds a new stage in The Balboa's programming strategies. Gary explains: "It is no secret that each week we are searching for the answers about what will bring audiences to our neighborhood theater. As we have written before, the calendared mixture of premieres and repertory was unpredictable and expensive to produce on a full time basis. Trying to find quality second runs this summer has been difficult. They either run out of interested movie-goers by the time distributors agree to let us play them or there are so few prints we can't obtain a booking. "The film opened last weekend and the multiplexes turned away big crowds. The distributor's plans called for expansion on August 18 but the demand was so strong that they decided to add theaters this week." The Balboa has stepped in to meet that demand. 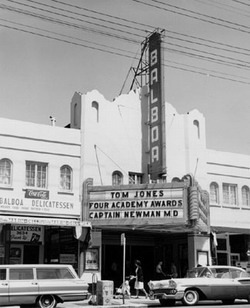 So all of you who voice your support for neighborhood theaters need to put your money where your mouth is and support the Balboa's continuing commitment to providing first-rate films in their historical venue. I'll be out there this weekend turning friends on to Little Miss Sunshine. Maybe I'll see you there? Michael-- I love to see any theater go through this kind of resurgence. It makes me wish I was a little closer to the Balboa so I could enjoy it more casually. As it is, it's on my list of must-dos the next time I visit the Bay Area. Thanks for the vigilance and the reportage. And by the way, a very nice piece on Green Cine Daily this morning. Combined with this post and with Brian's missives from the film scene in SF on Hell On Frisco Bay, you've made me regret my best friend moving from the Bay Area back to Oregon for the very first time, for it's going to be a lot harder for me to take in the city's pleasures now-- no more built-in excuses! But I am most definitely headed toward Vertigo again soon. Perhaps tonight?! Dennis, thanks for stopping by. Brian is the lucky one; he lives close to the Balboa. I wish I could take more advantage of Gary's programming. If I lived as close as Brian, I most certainly would. Thanks also for your kind words about Dave Hudson's Greencine summertime question. I, too, appreciated how we both wrote about Hitchcock. And was very honored to bring it on home. As for access to San Francisco, please feel free to contact me whenever you're on your way here. I'm purposely developing my network of contacts in various cities so that I can maximize my festival experiences. I've got a small house, but, as they say, in my home there are always two cups.